In addition to pre-existing autoimmunity, ischemia reperfusion injury and tissue healing necessitated by transplant surgery, along with anti-donor alloimmunity, result in inflammation15–18 and exposure of cryptic or sequestered self-antigens to the immune system.19–21 These processes overcome self-tolerance, resulting in de novo pathogenic autoimmunity. One example of this phenomenon in humans is the development of de novo post-transplant antibodies and T cell reactivity to lung-expressed type V collagen in lung transplant patients with bronchiolitis obliterans.8 Other associations include anti-angiotensin II receptors9 or anti-agrin22 antibodies in patients with kidney transplant rejection. The development of a protein microarray platform has permitted large-scale antibody screening to non-HLA antigens.23 Using such arrays, others showed that serum obtained from children with well-functioning kidney allografts contained antibodies to kidney-expressed antigens,24 some transplant recipients develop autoantibodies with acute kidney rejection and allograft loss,25 and autoantibodies are found in patients with chronic humoral rejection.26 Whether antibodies to non-HLA antigens are pathogenic and/or whether they can be used as biomarkers for transplant outcome remains unclear. Herein, we used a protein microarray to screen non-HLA antibody repertoires in kidney-transplant recipients with transplant glomerulopathy (TG), a histopathologically distinct manifestation of chronic allograft injury27,28 generally considered to be immune-mediated.29,30 We compared non-HLA antibody profiles of patients with TG to those with stable kidney function after transplantation. Our results, using test and validation sets and confirmed with ELISA assays, indicate that (1) transplantation induces antibodies reactive to a wide assortment of non-HLA antigens, but these reactivities are unique to the individual transplant recipient; and (2) pretransplant detection of antibodies reactive to a specific kidney-expressed target, peroxisomal-trans-2-enoyl-coA-reductase (PECR), is strongly associated with late development of TG. We studied non-HLA antibody repertoires in kidney-transplant recipients by screening serum samples for reactivity to a protein array containing approximately 9000 antigens. We initially performed experiments aimed at understanding assay performance. Figure 1A (left panels) depicts representative raw data derived from testing the serum of two individuals. The signal intensity (log2) and density of reactivities (percentage of all target proteins) are shown on the X and Y axes, respectively. To compare samples from different patients performed at different times and with various array lots and to define a positive threshold, we exploited the fact that each array contains negative (buffer), and positive control (human IgG), spots. The second and third panels in Figure 1A depict only these reactivities to the positive (red, ≈300 spots) or negative controls (black, ≈300 spots). We normalized the results among arrays so that the mean anti-IgG (positive) value was identical for each array (see Concise Methods and Figure 1A). Using the normalized data, we chose a stringent threshold to define a positive result at a signal intensity of log210 (1024, dotted line in Figure 1A, third panels), which reduced the false-positive detection of negative control spots to essentially zero. At this threshold, serum samples from normal volunteers and transplant recipients reacted to 0.07 to 27% of antigens (Figure 1A, right panels). As validation of our analytic methods, we tested commercially purchased pooled serum containing antibodies to Ro-52, La, Jo-1, TopoI, RNP, and Smith antigens for reactivity to the array (Figure 1B). The positive control serum reacted significantly to all six autoantigens. Signals for each reactivity were among the strongest detected (>98th percentile of 9000 antigens on the array). Serum from two of the normal volunteers reacted to none of the test antigens (all reactivities < log2 10 with percentile ranks ≤87%). The other two sera each reacted with only one of six control autoantigens (Figure 1B). To test intra-assay variability, we performed three replicate assays using a single serum sample (Figure 1C). These comparisons revealed Spearman tau correlations coefficients of 0.88 to 0.93, indicating approximately 10% intra-assay variability. To assess how well the array detected quantitative differences in antibody concentration, we performed side-by-side assays on serially-diluted serum samples (Figure 1D). These experiments showed that median signal intensities (left panel) fell with the dilution, as did the number of positive reactivities (right panel). Next we tested whether kidney transplantation alters antibody repertoires to non-HLA antigens. We obtained sera pretransplant and 12 months post-transplant from six stable kidney-transplant recipients (cohort 1; Table 1). Data from this ongoing trial indicate that these patients had serum creatinine values ≤1.8 mg/dl at 12 months post-transplant, no acute rejection episodes ≥ Banff 1A grade, and no detectable serum anti-HLA antibodies. We measured the non-HLA antibody repertoires by array and compared pre- and post-transplant results for each patient (representative result in Figure 2A and see Supplemental Figure 1). We found that Spearman tau coefficients averaged 0.55 (0.43 to 0.64; Supplemental Figure 1), indicating significant differences between pre- and post-transplant serum antibody repertoires for each recipient. Table 2 quantifies, for each patient and group, the numbers of weak pretransplant reactivities, within the lowest 10th or 30th percentile, respectively) that became strongly positive post-transplant (≥90th percentile). When we compared the results of serum samples obtained 12 months apart from normal volunteers (Figure 2A, left panel), we found essentially no change in the repertoires (Spearman tau, 0.91). Neither did we observe any reactivities that commonly increased from the lower percentile ranks pretransplant to above the positive threshold 12 months later (not shown). We next examined autoantibody profiles in patients with biopsy proven TG, a well-defined pathologic entity commonly associated with serum-donor HLA-specific antibodies.27–30 We evaluated pre- and post-transplant serum samples from five patients followed at Hospital 12 de Octubre in Madrid Spain (cohort 2) and seven patients from the Ohio State University (cohort 3). Clinical characteristics are summarized in Table 1 and Supplemental Tables 1 (A and B). Sera from four of 12 patients with TG contained donor-reactive antibodies by single-antigen testing. Serum samples were obtained a median of 4 years and 5.4 years post-transplant from the two cohorts, respectively. When we compared pre- and post-transplant repertoires for each patient (Figure 2A and Supplemental Figure 2), we found that Spearman tau coefficients ranged from 0.74 to 0.93. Few (range, 3 to 46) pretransplant reactivities within the lowest 10th percentile became strongly positive (> 90th percentile) in the post-transplant sample (Tables 3 and 4). We found essentially no overlap in the antigenic targets among the 12 patients (Tables 3 and 4). Ingenuity analysis revealed that these proteins mapped to diverse pathways (not shown). Reanalyzing the data with less stringent thresholds (<30th to >90th percentile) increased the numbers of reactivities for each patient but did not reveal any common targets (not shown). Together, the results suggest that TG is associated with changes in non-HLA antibody repertoires, but the induced alterations seem to be unique to the individual. Primary organ failure is commonly caused by and/or associated with autoreactivity directed at antigens expressed in the failing organ.31,32 Because pre-existing autoimmune memory likely persists post-transplant, it could negatively affect transplant outcome. To address this, we reanalyzed our data and assessed whether pretransplant autoantibodies that persisted post-transplant were strongly associated with the development of TG. To validate the data derived from the array, we tested pre- and post-transplant sera from each patient for reactivity to the three candidate antigens, PECR, PPIA, and AURKA by ELISA. We measured total IgG levels in a subset of 28 patients (nine with TG, eight with stable kidney function, and 11 patients on the transplant waiting list) and found no difference among the groups (not shown). Representative anti-PECR ELISA results from one patient (Figure 4A, left panel) show that the reactivity titrates with serum dilution (1:100 to 1:500) and antigen concentration. In patients with TG, reactivity to PECR was stronger than to a control protein (cysteine- and glycine-rich protein 2 [CSRP2]; Figure 4A, right panel, and Supplemental Figure 3), indicating specificity. Post-transplant anti-PECR ELISA results (Figure 4B) for cohorts 2 and 3 with TG and eight post-transplant, time-matched stable transplant recipients (cohort 5; Table 1 and Supplemental Table 1D) reveal stronger responses in each of the TG cohorts (P < 0.01 and P = 0.01, respectively). To strengthen our validation, we tested post-transplant serum samples from an additional cohort of nine patients with TG followed at Mount Sinai Hospital in New York (cohort 4; Table 1 and Supplemental Table 1C). We observed stronger reactivity in the separate TG cohort 4 compared with those with stable kidney function (P = 0.04), thus confirming the finding in a validation set (Figure 4B). Using a candidate threshold of 0.5 units (1:100 dilution), we calculated a positive predictive value of 62% with a negative predictive value of 100%. At the 1:500 dilution and a lower candidate threshold of 0.4, the positive predictive value was 86%, and the negative predictive value was 100%. When we correlated the pathologic grade of TG with the strength of the anti-PECR response in the 21 patients with TG (cohorts 2 to 4), we did not observe a significant relationship (Supplemental Table 1). Nor did we find a relationship between the presence of pre- or post-transplant anti-PECR immunity and the cause of the primary kidney failure (Supplemental Table 1 and Supplemental Figure 4). To test whether pretransplant anti-PECR antibodies are associated with the development of late TG, we performed anti-PECR ELISAs on stored sera obtained before transplantation from the patients who ultimately developed this histology (cohorts 2 and 3). The ideal control would be pretransplant sera obtained from time-matched patients to the TG groups (approximately 6 years) with biopsies negative for TG, but such samples were not available (surveillance biopsies are not routinely obtained 5 to 10 years post-transplant). Instead we obtained and tested serum samples from a cohort of 37 wait-listed kidney transplant candidates as controls (Figure 4C). We reasoned that because TG occurs in approximately 20% of transplant recipients at 5 years,37 for pretransplant anti-PECR antibodies to be predictive of TG, the strength of the pretransplant anti-PECR responses should be significantly higher in those with documented TG than in the randomly selected controls on the waiting list. We observed that the median anti-PECR reactivity was higher in those destined to develop TG (P < 0.01) compared with the 37 randomly-selected, wait-listed transplant candidates. At a proposed threshold of 0.5, we found eight of 12 (75%) patients who eventually developed TG to have anti-PECR immunity. At this same cutoff, eight of 37 (21%) wait-listed transplant candidates had anti-PECR reactivity (Figure 4C; P = 0.01 by χ2). To assess whether transplantation affects the anti-PECR response, we compared pre- and post-transplant results for the 12 patients with TG in cohorts 2 to 3 (Figure 4D). The median values did not differ (P = 0.43). The response increased in seven of 12 post-transplant. Two patients with negative values pretransplant (<0.5) became positive post-transplant. Reactivity fell in three patients post-transplant but did not fall below the 0.5 threshold. In contrast to the results for anti-PECR antibodies, when we tested sera for anti-PPIA reactivity post-transplant, we did not observe a correlation between the strength of the response and the presence of TG (Supplemental Figure 5). Nor did ELISAs for AURKA performed on a subset of 12 patients with TG and 17 patients without TG reveal differences between the groups (not shown). In addition to the post-transplant correlations, our analyses revealed that sera obtained pretransplant from patients who ultimately developed TG reacted significantly more to PECR than pretransplant sera from a randomly selected cohort wait-listed transplant candidates (Figure 4C), of whom only a minority will develop TG.40 Acknowledging the small sample size and the need for larger prospective studies, our results raise the possibility that both pre- and post-transplant antibodies to this kidney-expressed, non-HLA antigen could be used as a biomarker for the development of TG. PECR is a peroxisomal reductase involved in fatty acid elongation and to our knowledge has not been previously reported as a target autoantigen in any disease state. Although a pathogenic role for PECR in kidney disease is unknown, when we performed a GEO database analysis of gene array profiling studies to determine expression profiles for PECR (http://www.ncbi.nlm.nih.gov/geoprofiles), the analysis revealed strong expression in glomerular mesangial cells and renal tubules (Table 5). Together with reports that intracellular fatty acid accumulation can be a feature of kidney disease,41–45 the glomerular location of PECR makes a pathogenic role for anti-PECR antibodies plausible. Fatty acid accumulation could aggravate lipid loading of glomerular and tubular cells driven by increased endogenous synthesis and that may contribute to progression of kidney failure.41,42 We speculate that upregulated expression and release of PECR could occur as a consequence of primary kidney disease and if presented in a proinflammatory environment could result in B cell and/or T cell autoimmunity that could participate in the pathogenesis of allograft injury. Once induced, memory autoimmunity is long lived, high affinity, and rapidly engaged after another antigen exposure and resistant to immunosuppression.46,47 Autoimmunity to islet antigens portends poor outcome after pancreas or islet transplantation, anti-cardiac myosin antibodies detectable in patients with heart failure persist after transplantation, and their presence increases the risk of severe acute rejection.10–12 Our data indicate that anti-PECR immunity could function analogously in the context of kidney transplantation but will require further study. Whether antibodies reactive to PECR, an intracellular protein, participate in the pathogenesis of chronic injury or are nonparticipatory bystanders cannot be ascertained from our work. Studies by others revealed that apoptosis, induced by a variety of mechanisms, can reorient intracellular proteins such that they are expressed on cell surface blebs.48,49 In the context of lupus, this mechanism can result in concentrated and altered presentation of intracellular antigens to the immune system, stimulating autoantibody formation, specifically anti-SSA/SSB antibodies that are pathogenic mediators of congenital heart block, thus providing a context through which such antibodies to intracellular antigens could mediate injury.50 An alternative explanation for the association between anti-PECR immunity and TG is the detected IgG is a surrogate for anti-PECR T cell immunity that mediates the disease. TG has traditionally been described29,30 as an antibody-associated process that affects 5% of renal transplant recipients per year, decreasing allograft half-life by 50%.37,40 We and others have previously reported that TG can occur in the absence of donor-specific anti-HLA antibodies or C4d staining,51–53 a result supported by the findings in this study in which only six of 21 patients with documented TG had detectable donor-reactive antibodies. In contrast, we found that serum from the majority of patients with this pathology contained antibodies reactive to PECR. Moreover, of seven transplants from our cohorts in which C4d staining was reported to be positive within the glomeruli, sera from all seven contained anti-PECR antibodies and only three of seven contained donor-specific antibody. We acknowledge that the pathology of kidney allografts with TG, including those studied herein, also includes some elements of interstitial fibrosis and tubular atrophy. 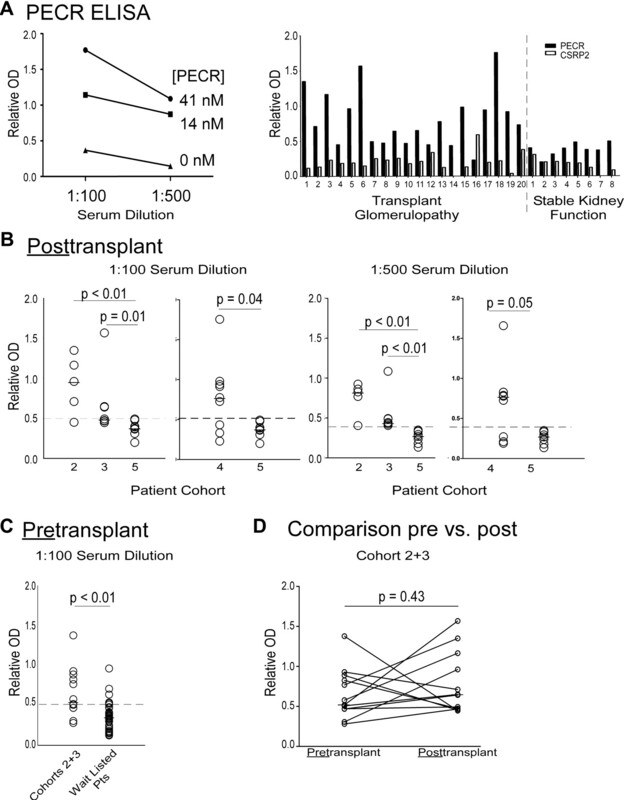 Although we do not have access to time-post-transplant–matched serum samples from patients with biopsy proven Interstitial Fibrosis/Tubular Atrophy (IF/TA) without TG as a control, the literature54 supports the idea that allografts from the stable patients have some degree of IF/TA, yet our data indicate that these clinically stable patients do not have serum reactivity to PECR. Our study highlights the strengths and limitations of large throughput protein microarray screening for identifying transplant associated biomarkers. Whereas the data indicate that such studies can be informative, high false-positive rates (only one of three antigens identified was informative) and cost of array experiments require careful selection of well-defined cohorts and novel analytical methods to enhance signal to noise. Further data mining and reanalysis of previously published studies in publicly available databases using such analytical approaches may provide additional valuable information. All serum samples were collected with informed consent and ethics approval by all local institutional review boards. After collection, all of the serum samples were stored in aliquots at −80°C. We obtained and tested two different serum samples from four normal healthy controls 12 months apart. The median age of the normal subjects was 37.5 years (age, 23 to 50). We obtained pretransplant sera from 37 patients participating in the Clinical Trials in Organ Transplantation CTOT01 observational trial (www.ctot.org). In six of these patients, we also obtained serum samples 1 year post-transplant. Unvalidated clinical data from this ongoing trial indicated that these six patients had stable renal function with serum creatinine ≤1.8 mg/dl at 1 year and no serum anti-HLA antibodies at 1 year, and none experienced an episode of acute cellular rejection. These six stable patients are termed cohort 1. We obtained pre- and post-transplant serum samples from two independent cohorts of patients diagnosed with biopsy proven TG (Banff 1997 criteria). Samples from five patients (cohort 2) were obtained at the Hospital 12 de Octubre (Madrid, Spain), and samples from seven patients (cohort 3) were obtained from the Ohio State University transplant program (Columbus, OH). Donor-specific anti-HLA reactivity was detected in one of five patients by Luminex in the Spanish cohort and in three of seven patients in the Ohio State cohort by GenProbe single-antigen testing (see Table 1 and Supplemental Table 1, A through E) for detailed demographics. We obtained post-transplant serum from nine patients at Mount Sinai Medical Center with biopsy-proven (Banff 1997) TG (cohort 4) and from eight patients with stable kidney function (cohort 5) time matched to cohort 4. Donor specific antibodies were determined by Luminex single-antigen testing. We used the ProtoArray microarray platform versions 4.1 and 5.0 (Invitrogen, Carlsbad, CA), which contain duplicate spots of approximately 9000 glutathione S-transferase-tagged human proteins printed on a nitrocellulose slide. The antigens include a selection of intra- and extracellular proteins of known function, multiple proteins derived from open reading frames of unknown significance, and human immunoglobulins (see http://www.invitrogen.com/site/us/en/home/Products-and-Services/Applications/Protein-Expression-and-Analysis/Biomarker-Discovery/ProtoArray.html for details). The proteins expressed on the array were selected by the manufacturer and not chosen for their putative relationship to transplantation immunology. As per manufacturer instructions, the microarrays were stored at −20°C and were equilibrated for 15 minutes at 4°C immediately before use. After a 1-hour block in 50 mM Hepes (pH 7.5), 200 mM NaCl, 0.08% Triton X-100, 25% glycerol, 20 mM reduced glutathione, 1× Synthetic block, 1 mM dTT, (pH 7.5), deionized water (www.Invitrogen.com), serum diluted 1:500 in wash buffer (1× PBS, 0.1% Tween 20, 1× Synthetic block, deionized water) was added and incubated for 90 minutes. The arrays were washed five times with wash buffer at room temperature, followed by incubation with an AlexaFluor 647-conjugated anti-human IgG (1 μg/ml) (Invitrogen) for 90 minutes at 4 °C. After an additional five washes at room temperature, the arrays were dried and scanned with an Axon 4300A (Axon, Toronto, CA). Scanned images from individual arrays were converted into digital signals, which were analyzed. The raw data files are available upon request from the authors. Although the manufacturer provides an analysis tool, Prospector Analyzer, the limitations of the program are that data can only be compared from arrays of the same lot and version. We therefore performed an independent analysis using internally developed software on the R platform (http://www.r-project.org/). We determined strict signal thresholds, quality checked each array by examining true positive and true negative signal distributions, summarized protein expression from replicate spots, and normalized intensities using IgG and buffer signals. Software and analysis algorithms are available upon request from the authors. An overview of our analysis strategy follows. All of the arrays contained 300+ buffer spots (no antigen) and 300 anti-IgG-positive controls. GPR (GenePix Result) files were generated and read, and the raw signal values were converted to log2 scale. Noise channel values (between antigen spots) were discarded. Using only buffer and anti-IgG spot values, we estimated positive and true negative cutoffs for each array. Modified median-shift normalization was performed (the arrays were scaled so that the difference between the median of the true negatives and the median of the true positives was identical for each array). The signal values for each array were shifted so that the mean anti-IgG (defined as positive) value was identical for each array (Figure 1A). All of the reactivities were also assigned a percentile rank (0 to 100%). Signals above the 90th percentile were considered to be significant, corresponding to a normalized signal value of 1024 on arrays. This value was chosen because it minimized the false-positive rate. Although the stringent threshold elevated the false-negative rate, we chose to sacrifice potential loss of data so as to limit the numbers of antigenic targets required for expensive validation studies. Rank shifts between pre- and post-transplant samples were then compared. Patients sharing a clinical phenotype (i.e. stable kidney function or TG) were analyzed on the same array version to minimize version to version variability. Normalized signal values and percentile rank shifts were used as dual methods to stringently stratify differences between groups when the groups were tested on different versions of the array. When assessing signal reactivities between array versions, only normalized signal intensities/percentile ranks were studied for antigens with similar amounts spotted between versions (within two-fold of each other) to minimize false positives. ELISAs were developed to detect IgG reactive to PECR, PPIA, and CSRP2, which were manufactured in a baculovirus system and purchased from the array manufacturer (Invitrogen). Immulon 4HBX plates were coated with 41 and 14 nM of antigen diluted in bicarbonate coating buffer (Sigma) at 50 μl/well in triplicate. The plates were incubated overnight at 4°C on a plate shaker (120 RPM) and washed. All of the wash steps were performed with 1× TBST at 300 μl/well five times. The plates were blocked for 1 hour in 1× TBST and 2% dry milk at 100 μl/well and then washed. Serum was diluted in 1× TBST and 2% dry milk at 1:100, 1:500, and incubated for 2 hours at room temperature, followed by five washes. Secondary HRP-conjugated goat-α human IgG (Santa Cruz) was added to all of the wells at a 1:4000 dilution at 50 μl/well for 1 hour and incubated at 4°C. After another five washes, tetramethylbenzide liquid substrate (Sigma) was added to all of the wells at 100 μl/well and allowed to develop for 30 minutes. Stop solution (1 N sulfuric acid) was added to all wells at 100 μl/well, and the plates were read at 450 nm. Background serum reactivity in the absence of protein antigen served as an internal control and subtracted from reactivity against protein. Microarray results were compared using Spearman tau correlations in which results are expressed as 0 to 1 with a perfect correlation being 1.0. The distribution of anti-PECR reactivity was tested for normality using the Kolmogorov-Smirnov and Shapiro-Wilk tests of normality. OD values of reactivity values were compared by nonparametric tests on the basis of data distribution. Median reactivities were initially compared among all groups using a Kruskal-Wallis one-way ANOVA and thereafter among individual groups using a Mann-Whitney U test or X square. P values of <0.05 were considered statistically significant. Statistical analysis was performed with the SPSS version 18.0 software package (SPSS, Inc., Chicago, IL). The authors acknowledge the efforts of the Clinical Trials in Organ Transplantation investigators, including D. Hricik (Case Western, Cleveland, OH), E. Poggio, (Cleveland Clinic, Cleveland, OH), R. Formica (Yale University, New Haven, CT), K. Newell (Emory University, Atlanta, GA), P. Nickerson and D. Rush (University of Manitoba, Winnipeg, Canada), and J. Gobel (University of Cincinnati, Cincinnati, OH), for collecting patient samples that were used as part of the work and thank Denise Peace for her technical guidance. This work was supported by National Institutes of Health Grant U19AI063603 awarded to D.R.S. and an American Recovery and Reinvestment Act (ARRA) supplement to National Institutes of Health Grant U01AI63594 awarded to P.S.H.